I love having a fully stocked pantry. 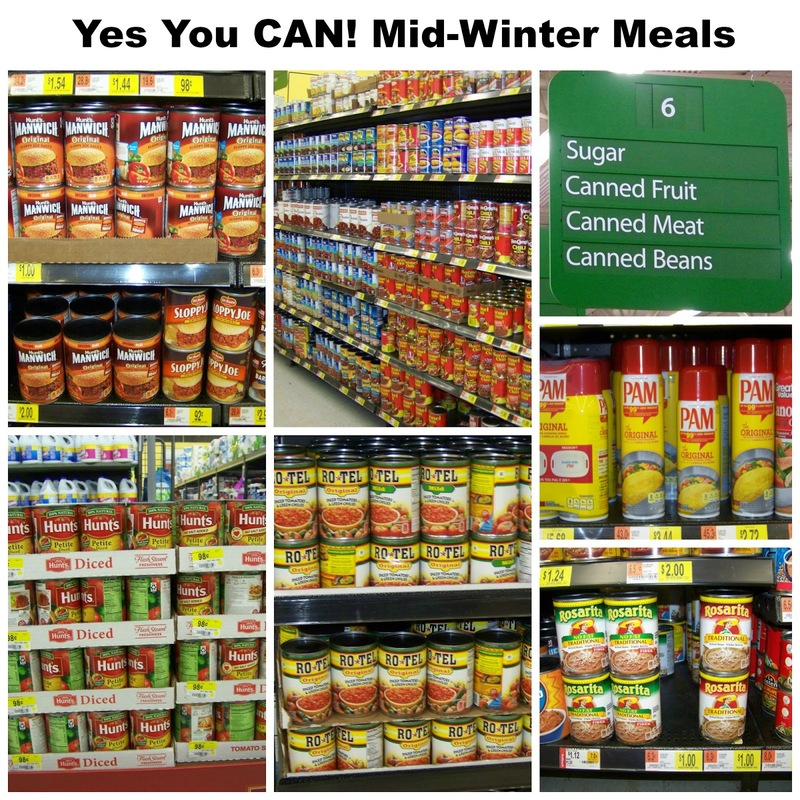 I always make sure to have loads of canned goods that are perfect for creating easy and delicious comfort meals during the cold weather months. Mid-winter is a time when my family is very busy with school and extracurricular activities. I know that keeping a well-stocked pantry helps me cook dinner for my family easily and that makes my life stress free. By using canned ConAgra products and some fresh produced for a green salad or some delicious baked bread from Walmart, I can get dinner on the table for my family quickly and that makes all of us happy. 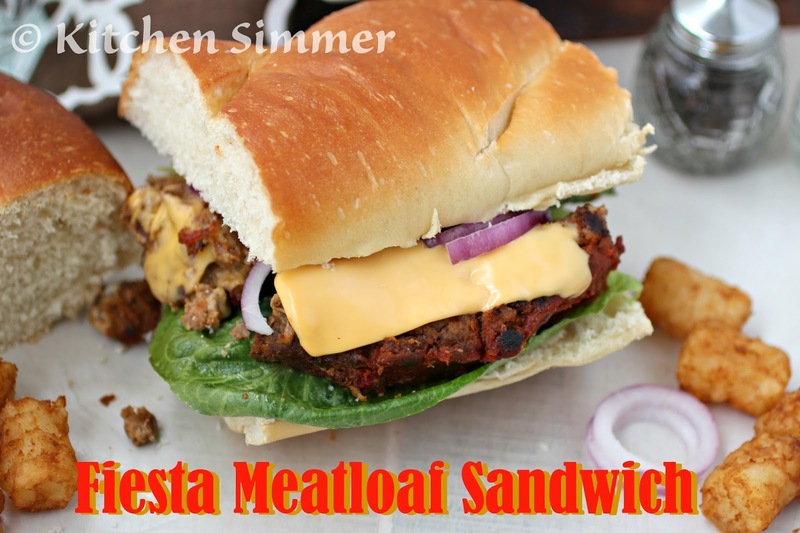 Today I bring you a fun Fiesta Meatloaf. 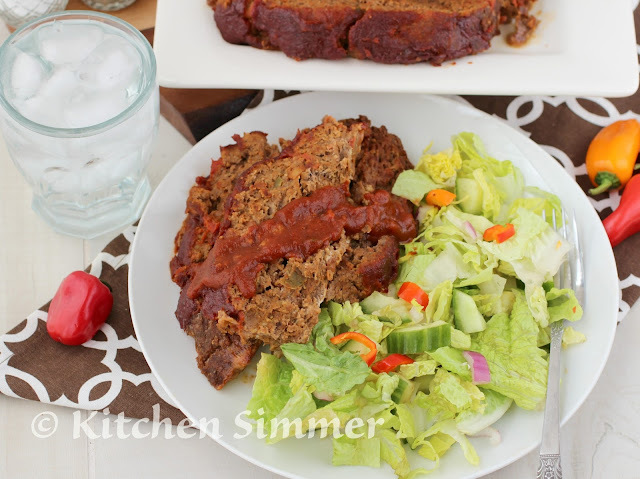 I used ingredients like RO*TEL diced tomatoes with green chilies and Rosarita Refried Beans to create a very flavorful and moist meatloaf. I even made my own sauce for the meatloaf by using a can of MANWICH (Bold flavor) and Hunt's Tomato Sauce with some spices. 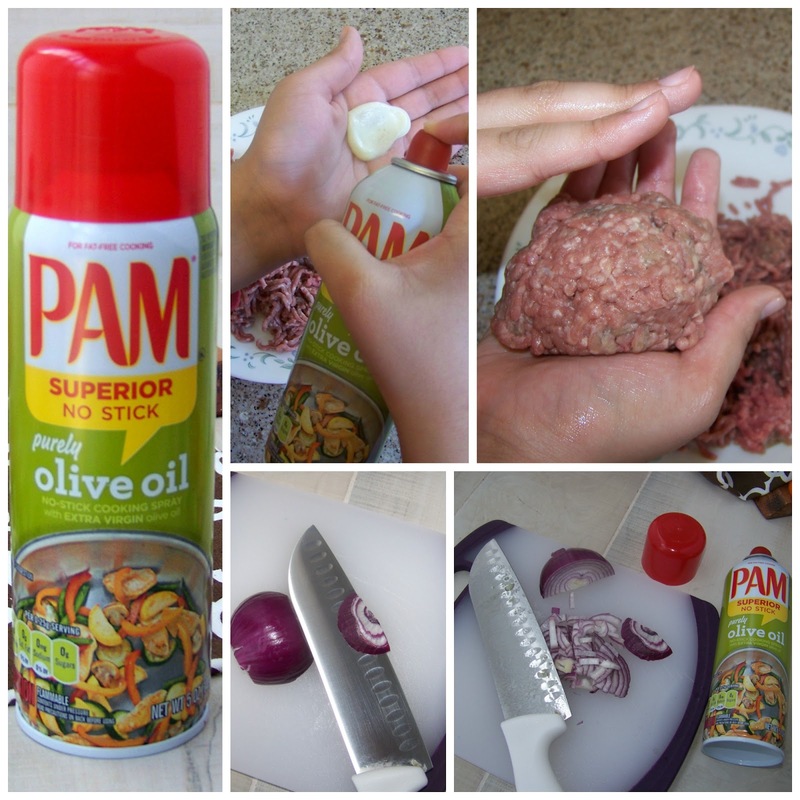 Also, check out my cooking tips using PAM Cooking Spray to keep your hands clean when mixing that meatloaf. This meatloaf only takes minutes to get ready and the rest of the time it's baking in the oven. The best part is it's also enough for two dinners. As a busy Mom, I know that cooking once and stretching it out for two dinners is always welcome. My second meal during the week was pan grilled Meatloaf Sandwiches. I don't know which meal my family loved more, but they definitely loved that meatloaf. 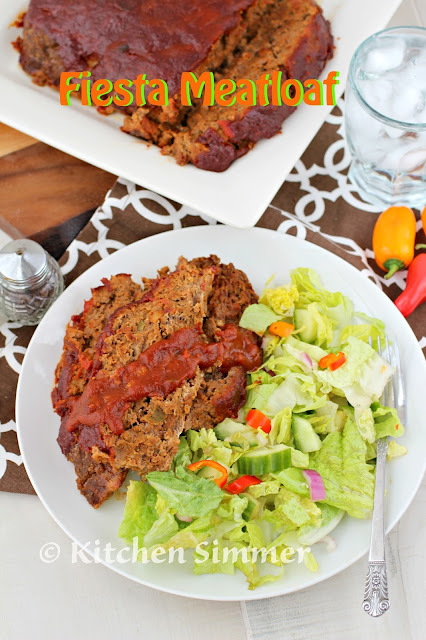 Note: Two kinds of chili powder are used in this meatloaf. One is the kind for heat (like cayenne) and the other is the kind you use in chili or Mexican style food and is not spicy. Crack eggs into large bowl. Then add chili powder, garlic powder, cumin powder, onion powder, salt and black pepper and red chili powder. Stir well. 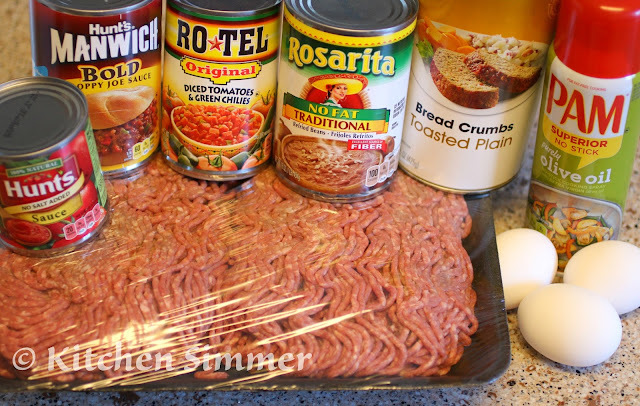 Then add the RO*TEL, Rosarita Refried Beans and breadcrumbs. Stir well and combine. Tip: I like to mix all the flavor ingredients together before adding the meat. That way everything is distributed evenly through the meat. In a pan, stir together the MANWICH and Hunt's Tomato Sauce with brown sugar, chili powder and red chili powder. Cook on low for 15-20 minutes. Then top the partially cooked meatloaf with most of the sauce. Keep some sauce if desired to serve at the table. Once meatloaf is fully baked, allow it to sit for 10-15 minutes before cutting and serving. Serve with desired sides or a green salad. Enjoy. I headed over to Walmart to stock my pantry with all my favorite canned goods. Don't forget to stop by the Bakery and pick up some bread for the Meatloaf Sandwiches and produce to make your green salad for both meals. My husband could not stop raving how soft and delicious the bread was from Walmart's Bakery. Pan fry sliced leftover meatloaf using PAM cooking spray. Melt cheese on top of meatloaf. Once cheese is melted, place on loaf of sliced bread and create sandwich with lettuce, onions and condiments. PAM Cooking Spray is not just for spraying a baking sheet before baking. 1. You can also use it to keep your hands "gunk" free when dealing with meat like making hamburgers. Simply spray on palms and rub between your fingers then tackle any job dealing with ground meat. 2. You can also spray your knife to help keep onions or veggies from sticking to your knife. Simply spray on both sides of your knife and the onions will slide off your knife. No more stopping to remove onions or veggies when you are busy chopping. Find more easy to make recipes that are perfect during the cold winter months by visiting: Yes You Can Recipes! To check out more about these great canned products, follow them! I love a two-fer especially when it comes to a great meal! 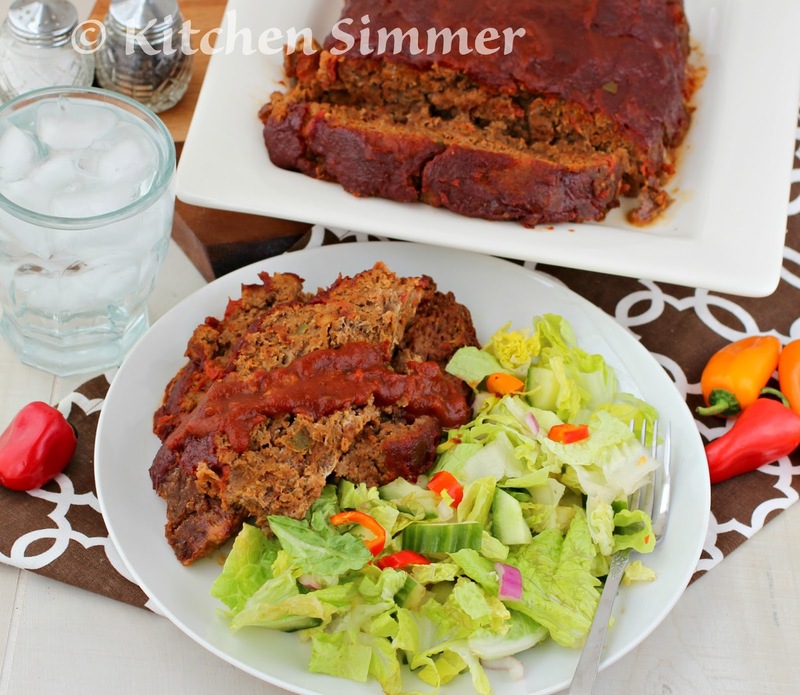 What an incredible meatloaf Ramona! And hearing about your well stocked pantry reminds me I need to go grocery shopping! 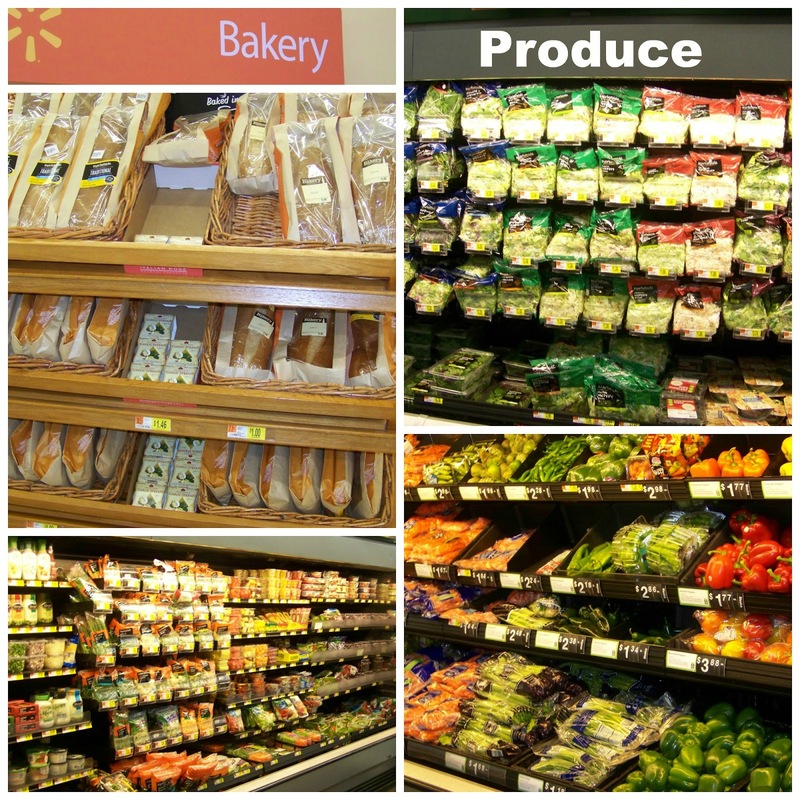 LOL re the photos of your grocery shopping! 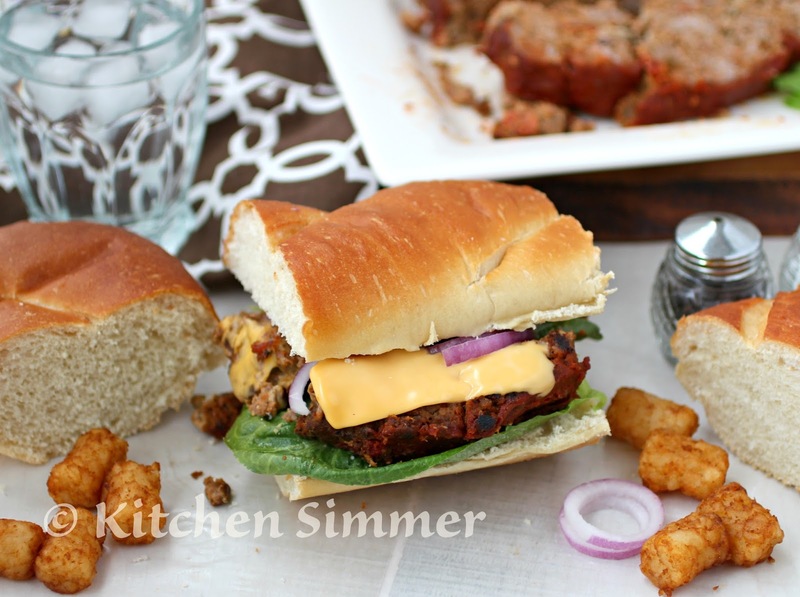 :) This meatloaf is comfort food for sure!